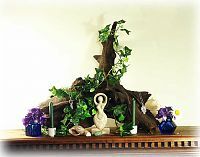 Creating an altar is an intensely personal process. 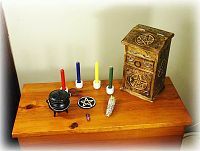 Although many altars have common elements, there is no set formula for selecting them. 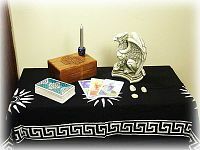 What you choose to display will reflect the purpose of your altar, as well as your own unique personality. 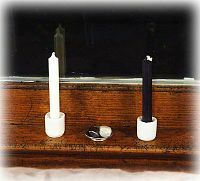 Some altars act like touchstones, as a place we can come to center and ground ourselves at the end of a busy day. They are a bit of sacred space in the mundane world. 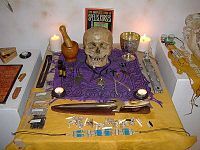 Some altars may have a specific purpose, such as a healing altar, or a prosperity altar, and act as a focus for magical intent. 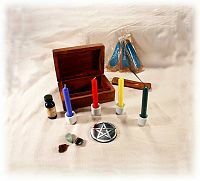 Portable Altars These are wonderful not only for people who travel often, but also those who are short on space in their homes, or who need to be able to pack their altars discretely away when friends come to call. Design your own starting with the items below. We will continue to add to this page, so be sure to check back!